American financial institutions can also be "subject to civil penalties of up to the greater of $250,000 or twice the transaction value," the site says. Nike’s official statement did not specify what part of the U.S. sanctions supplying shoes would have violated. This decision by NIke has been met with outrage by the head coach for Iran’s national team, Carlos Queiroz. "Players get used to their sports equipment, and it's not right to change them a week before such important matches," Queiroz told reporters outside the team’s training session in Moscow on Wednesday. The players usually practice with the same shoes they will use in the official games. Queiroz also called on FIFA, the international association in charge of the games, to address the matter. “I haven't gotten clarity on what legal basis [Nike] is using to say this. They should reference what part of the sanctions they are talking about, since technically they're not selling anything," said Trita Parsi, the president of the National Iranian American Council. The reason Nike won't be providing the shoes is that there is "no general license permitting the transfer of U.S.-origin / owned clothing to Iran," Richard Nephew, a former director for Iran at the National Security Council and a sanctions expert, told NBC News via email. "We have such licenses for humanitarian goods and shoes usually don't count," Nephew said. The Treasury issues some licenses in order to authorize activities that would otherwise be prohibited with regard to Iran, but Nephew said that Nike's shoes are likely not covered by these licenses. He said this has been the United States' policy since approximately 1995 when the embargo was set up under President Bill Clinton. However, the Iranian team wore the brand’s shoes during the 2014 World Cup. At that time, Iran was under heavy sanctions imposed by the Obama administration before the nuclear deal was signed in 2015. Since the 1994 World Cup, Nike has also been representing specific players and providing the official game shoes for more than half of the players in the World Cup. It's unclear how Nike’s decision will also affect one of its sponsored players, Swedish-born Saman Ghoddos, a striker for Iran, and if he will be forced to wear another brand. The Washington Post reported that other sponsorships for individuals and teams will not be affected by the decision, and that teams may still allow players to choose their own brands of shoes to wear in competition. Adidas, a German brand, has had a partnership with FIFA since 1970, and is contracted to sponsor the World Cup until 2030, according to Reuters. It will be providing the jerseys for the Iranian team. The Trump administration has warned Germany and German businesses not to do business with Iran. Nike did not respond to NBC News' followup questions on the topic. FIFA and Adidas did not respond to NBC News' requests for comment. “The type of cultural wars that [Trump] is quite keen on fighting seem to surround the sports world and he has turned the sports world into a political arena,” said Parsi. Parsi was referring to the president’s battle with NFL players who chose to kneel during the 2017-18 season to protest police brutality against black Americans. Trump has accused the players of being unpatriotic, and this week rescinded his invitation to the Philadelphia Eagles, the 2018 Super Bowl champs, to visit the White House. Nike’s decision is based on Trump's decision to withdraw from the joint agreement between Iran and the five permanent members of the United Nations Security Council — the U.S., China, France, Russia, and the United Kingdom — plus Germany and the European Union. The official sanctions against Iran are set to kick in less than six months from the president’s decision on May 8 to withdraw from the agreement. 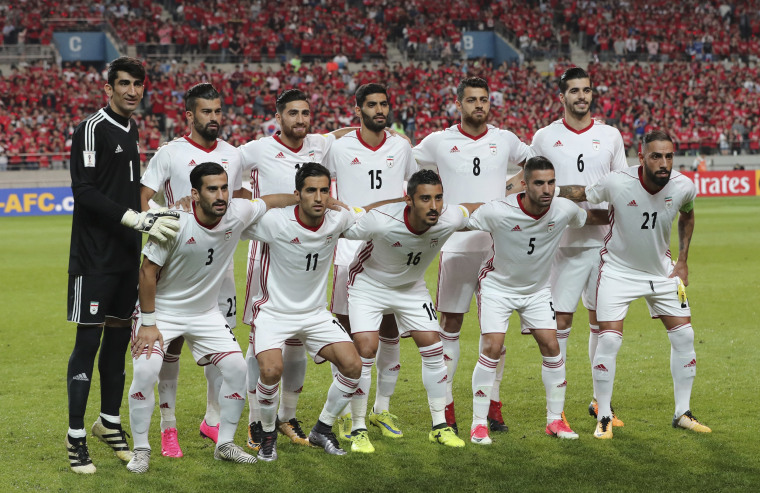 Iran’s first World Cup game is against Morocco on June 15.